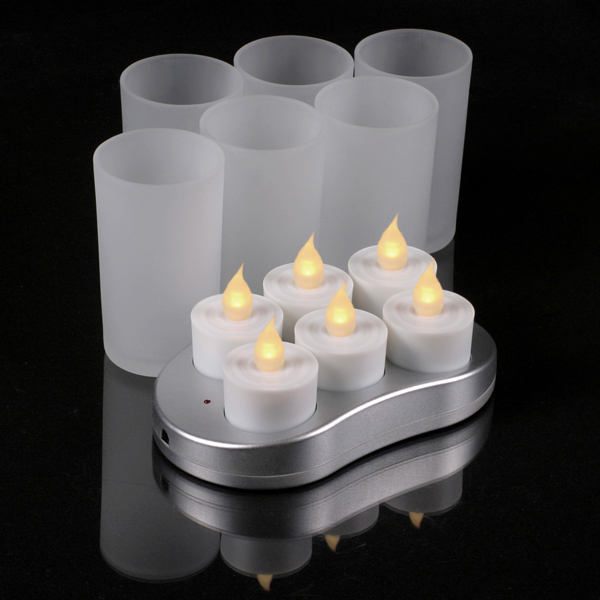 You can decorate your home with restaurant quality rechargeable tea lights that include frosted glass holders and rechargeable base. These two inch tall amber tea lights each have their own four inch holder and can be charged hundreds of times for about two years of constant use. Just take the tea lights out of the holders and insert into the recharging base overnight. Each tea light will flicker for approximately 8-10 hours after charging. An on/off switch is located on the bottom of each tea light to preserve battery and tea lights charge more efficiently when tea light is switched off. Set includes six frosted glass tea light holders, 6 rechargeable amber flickering tea lights and charging base with UL 120V adapter.